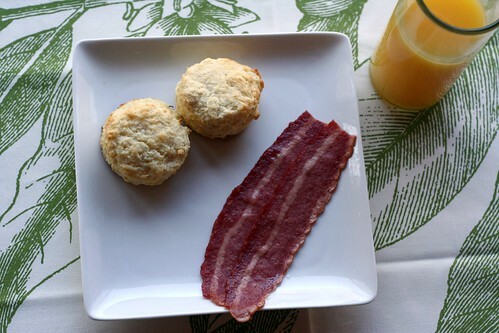 honey & jam | recipes + photos: Breakfast, and my favorite biscuit recipe. 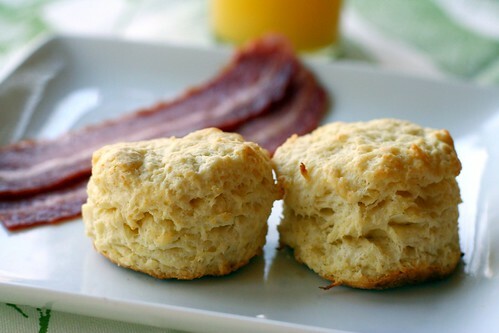 Breakfast, and my favorite biscuit recipe. Cut in butter with a pastry blender until mixture resembles coarse crumbs with some pea-sized pieces. Add milk and sit with a fork until clumps form, making slightly stick dough. Place dough on a well floured work surface. Coat your hands with flour and knead gently 8 to 10 times. until the dough just holds together and is no longer sticky. Gently pat dough into a 9 inch round at least 1/2 inch think, lifting dough occasionally so it doesn’t stick to the surface. Cut 2 1/2 inch biscuits with a biscuit cutter (or just use to top of a glass). Place biscuits about 1 inch apart on an ungreased cookie sheet. Press and remaining scraps together and cut into biscuit sized pieces. These are also really good if you add in some cheese and use garlic salt in place of regular. Also, I don't roll mine out quite as much as this recipe calls for. I like them a little taller. Yummy!!!!!! I wish I had patience to make my own biscuits and these look easy!! There are only two of us in the house though so I wonder if I can make a big batch and freeze some? Then I could take a few out everyday and toast them up. i was thinking about biscuits today...these look perfect. I made these tonight and they did not get big like yours did. I followed the recipe and I wonder what I did wrong? How many was it suppose to make? this recipe makes 8, give or take. I probably should have stated that I don't roll mine out as thin as this recipe calls for, because I like them a little bigger. Hello Hannah! I've been enjoying your blog from the Bay Area, CA. It always brightens my day. I'm curious--what kind of bacon is that? It looks so lean! Hey Kelly! It's turkey bacon. and delicious. OOOOOh I'm loving the pretty patterns! Oh my!! i'm in love with your biscuits.. dying to have a bite..
wow, looks so simple! I LOVE biscuits! I'm diggin' the tall biscuits! They look picture perfect! What kind of bacon is that? It looks perfect too! I just made these about an hour ago and they were so good! Mine made eight tall biscuits, like stated. An summarize will help keep you targeted while http://www.scholarshipland.org/nordstrom-scholarship/ composing your article, and help keep you from roaming endlessly in performing your research..